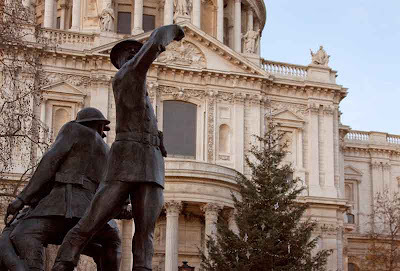 Blitz is the name of this statue, across from St Paul's Cathedral, commemorating the1002 firefighters who died fighting fires in Britain during the 2nd WW. A great photo of a great sculpture in front of a magnificent cathedral! Bravo for those fearless heroes! Thank you for that Mo. Even across an ocean and generations I feel grateful to those fighters. What a beautiful way to honor and remember them!